Crescent Dunes followed a much smaller experimental DOE-funded tower pilot, the 10 MW Solar One/Solar Two, which was tested during the 90s and dismantled in 2009. SENER's Noor III is also much larger than its Gemasolar plant near Seville, the first ever commercial tower CSP with molten salts storage, that has operated successfully round the clock since 2011, but is just 20 MW. This relative "youth" of tower CSP technology, and especially tower with molten salts energy storage, compared to trough,(How trough CSP differs from tower) gives it great potential for cost reduction, according to SENER. "Tower has not been deployed as much as parabolic trough," the Performance Guarantee Manager at SENER, Sergio Relloso told SolarPACES in a Skype call. "We have about 5 GW of CSP technology deployed in the world today, but approximately 4.5 GW of it is parabolic trough, so trough comprises 90% of the CSP that's deployed." 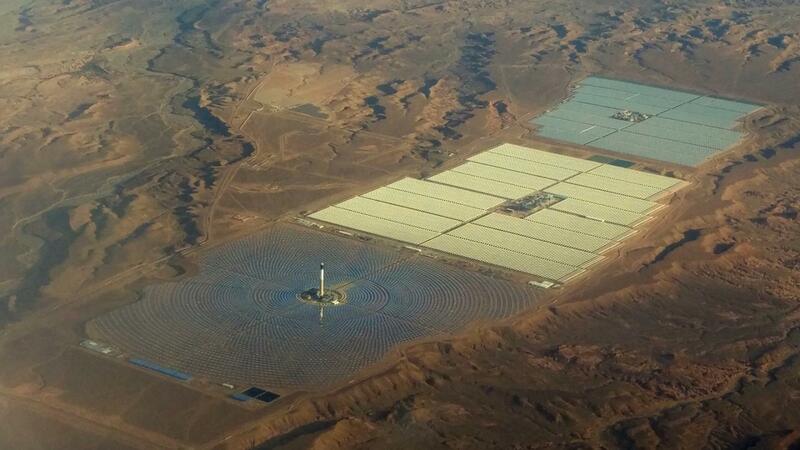 Noor III, at 150 MW, the world's second utility-scale Concentrated Solar Power (CSP) tower with molten salt storage, will deliver power to Morocco's electricity grid by October, if not sooner. "Noor III receiver installation on tower has been finalized already, so we are ready to continue the commissioning of the plant with the solar field operative," the Performance Guarantee Manager at SENER, Sergio Relloso told SolarPACES in a Skype call. "Noor II for example was synchronized the first week of January and then we initiated the ramp up to 100% of plant load of 200 MW, to later commence commercial operation of the plant. In Noor III we are under commissioning now, with the target of reaching synchronization in summer." At 150 MW gross capacity, Noor III will deliver 140 MW of net capacity during Morocco's Peak Hours Time Slot.The remaining 10 MW supplies power for the site itself, the so-called 'parasitic' needs that are normal at power plants. With 7.5 hours of storage, Noor III was optimized to meet the demand during five peak hours daily during which the electricity price is 18% higher. The first two CSP plants at Ouarzazate, Noor I and Noor II, both trough, have 3 and 6 hours of storage respectively. Although Noor III is SENER's 29th CSP project, it is only its second CSP tower with molten salts storage. SENER's Gemasolar was the world's first commercial tower CSP to include thermal energy storage with molten salts. It has been operating reliably since 2011, generating solar power for hours after dark near Seville in Spain. Gemasolar has the capacity of producing electricity on a 24/7 basis. SENER also engineered and built the 160 MW Noor I and 200 MW Noor II, the latter together with China's SEPCOIII. SENER is technology provider for the entire Noor III project, the solar field, the solar receiver on the tower, the controls that keep these two in sync together, the solar thermal storage system in molten salts and the power block. It shares EPC duties with China's SEPCOIII, which is mainly involved in all the components and subsystems of the Power Island. CSP trough prices have come down considerably since their first deployment, as efficiencies of production tend to lower costs. Yet SENER was able to price Noor III similarly to the trough project, Noor II. "If we can achieve a similar cost between the tower and the trough, when there is such a low deployment of tower, we are sure we have much more potential for cost reduction, but we will need to make more tower," said Relloso.